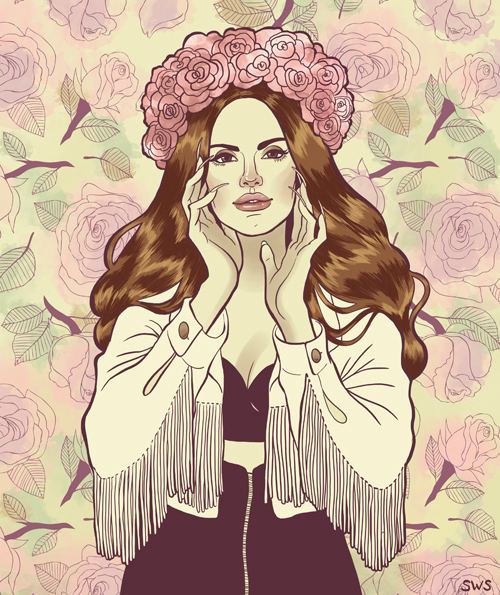 A product of recent internet hype, Lana Del Rey is currently one of the most quickly emerging artists. Her album "Born to Die," which has mixed reviews from critics, drops tomorrow. I'm interested to see the direction her career goes in. Will she fade back in obscurity, or will she continue to live up to the hype? © 2011 shannon snowHer rise to fame seems very calculated, with the change-of-name and plastic surgery she's had. But I find her fascinating to look at, like watching a living doll. And as for her music, I actually really like it. Check out her single "Born to Die" here. For this piece, I used a repeat pattern that I created a while back.